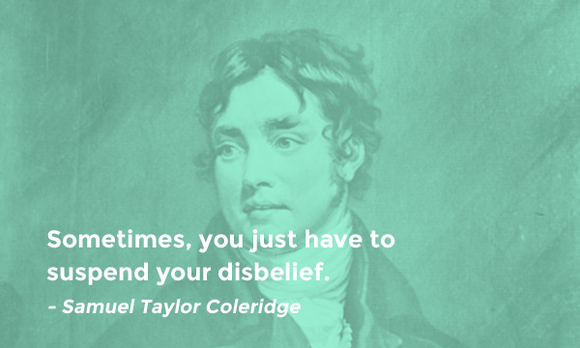 ‘Suspended disbelief’ is a phrase coined by philosopher Samuel Taylor Coleridge to describe the phenomenon where we humans have to suspend our disbelief of something in order to enjoy it. For example, when you attend a magic show and see that magician cut his assistant in half there is a part of you that knows he’s not REALLY cutting her in half. But if you harped on the fact that you know it’s not real, you won’t enjoy the magic show very much. This same idea comes into play in all kinds of other places including programming. When you are learning a new technology, whether you are learning to write your first programming language, or just the latest framework, you go through this uncomfortable phase where you know that the code you are looking at is doing this THING but you don’t understand HOW exactly it’s happening. This is a normal part of the process of learning a new technology, and in fact, it’s a critical part of the process. You see when you encounter a new programming language part of your learning process includes learning to train your eye. The way to train your eye is to read a good deal of code even when you don’t totally understand what it’s doing. To repeat: part of the learning process includes reading the code before you understand exactly how it’s working. In those moments you have to suspend your disbelief and not get hung up on the fact that you don’t understand each and every aspect of the code you are looking at. Yes, you can TOTALLY ask questions and try and figure it out, but every now and again you have to remind yourself that you can’t possibly understand it all right away and that believe it or not, reading code you don’t totally understand is a productive part of the learning process. We have tried to strike a balance in the lessons of throwing you in the deep end, but also giving you highly specific tasks to do in the deep end so you don’t totally drown. It will come, we promise!